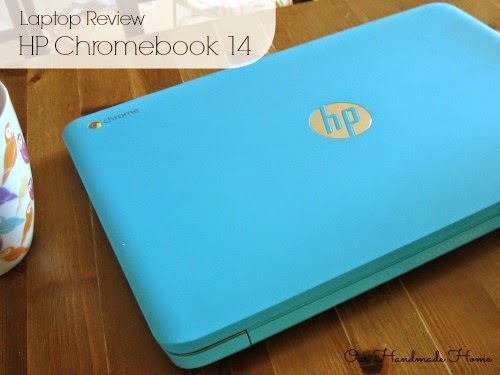 The lovely people at HP sent me a Chromebook 14 to play with for a few weeks. A Chromebook (to the uninitiated) is basically a Google computer - It is a laptop with a tiny bit of local storage. It runs much faster than a standard laptop and you can use it for almost everything you would use a standard laptop for. I love it, and I won't be sending it back, they'll have to come and prize it out of my cold dead hands... OK. I will send it back, but I'll cry when they take it away. My MacBook gave up the ghost and was sold on a few months ago and when this Chromebook gets sent back I will be back to using Small's ancient laptop. Boo! 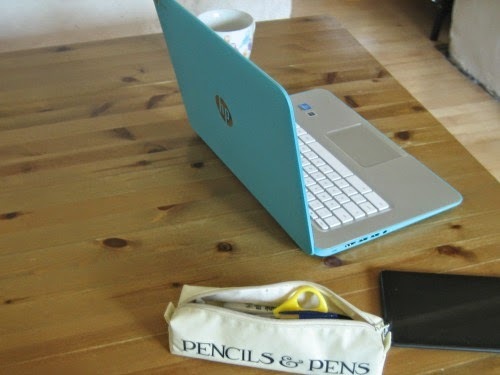 The 'HP Chromebook 14' comes in 3 snazzy colours: Aquamarine, Red and White (I'm sure they call them hip names like seal-pup-turquoise and angel-tears-white) The aquamarine one HP sent me is just a teeny bit sparkly, not necessary but I like shiny things. The keyboard is a lovely size and really nice to type on. 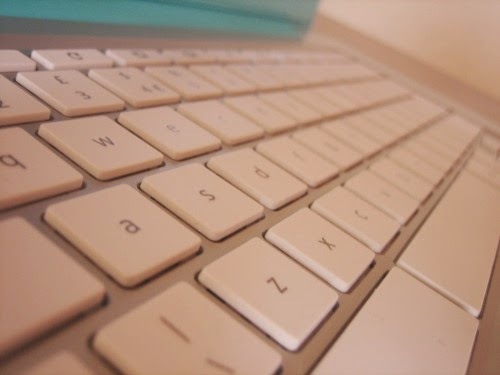 I do quite a bit of typing for the blog, and a keyboard that is intuitive and ergonomic is essential to me. It is very similar to my old MacBook keyboard. The touch pad is a nice big size - it is an all-in-one style and I'd prefer a separate clicky button, but I'm told most laptops are this style these days. It's something you would get used to. It is a very quiet machine, no whirring or humming (because there's no hard-drive. I found the 14 inch screen a good size, colour is a bit weak, which is challenging when designing blog features and editing photos (I had to check some of my visuals on my nexus tablet, which seemed silly) It is a shame the screen couldn't live up to the rest of the machine. It matches my favourite mug!! Look!! With a Chromebook you are submitting yourself to working from the cloud. There is a small amount of flash storage (16Gb) but in general all documents, photos, music, etc are stored in the cloud. The beauty of this is being able to log in on any computer and everything is right there, you won't loose it by having your laptop stolen or lost, you can edit on your phone or tablet, log in at Auntie Jan's house to show her baby photos without having to drag your laptop everywhere. The downside is the cyber-security issues of having everything stored remotely rather that in your own hands, that's a decision only you can make. The Aged P refuses to have anything stored in the cloud and lives in fear of cyber-attacks... I relish in the freedom the cloud gives me and trust Google's security... it is entirely possible neither of us are right. You really need to have an internet connection to use your Chromebook, the model I have been sent comes with a slot for a sim card so you can use it out and about, some data is included in the purchasing package. But I have only used it on wifi. Software and security updates are automatic. So no security software to fork out for, and no checking for security updates every time there is a scare story on the news, brilliant! All extra software comes from the Chrome Webstore. There are plenty of games, tools and productivity applications available, quite a chunk of them for free. Some will work offline, or store some information locally to allow you to work offline. If you already use other Google products then a Chromebook couldn't be easier. 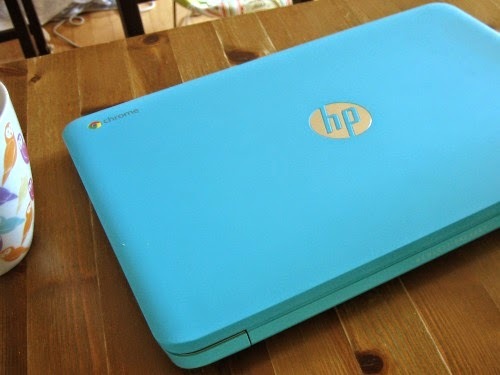 This Chromebook currently sells for £269 in the HP online shop. Follow the link for the full spec of this model. Best Bits - speed, keyboard, the pretty colour, all the software. 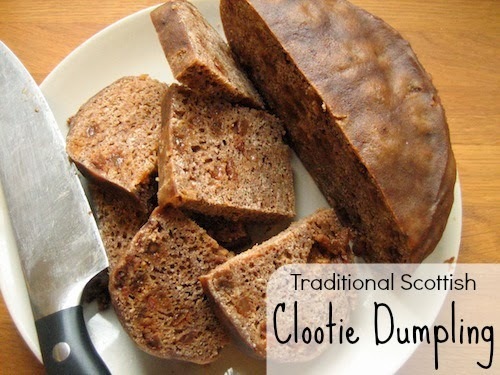 Would I recommend it? - If you want a simple, fast laptop then yes. Would I buy one? - Yup, I'm saving up for one. Full disclosure: I am not paid by HP - They send things, I use them and play with them for a few weeks, I send them back and review them honestly.